A little while ago I enrolled on Janet Prays ‘Sew better, Sew faster: Garment Industry Secrets course on Craftsy. It took me a little while to make a start on this as I was a bit peeved to have to pay VAT+Post Office charge on the imported pattern. I should have known that I would have to at some point – but it was galling that the Post Office handling charge was more than the tax to pay. As I bought the course while it was on sale I really have no cause for complaint. Anyway, I have been threatening to make something for myself for a little while but someone else always seems to jump ahead. I justified this as research. I traced off the size I wanted to use rather than cutting the pattern as I may want to make a different size later. Rather than using the size I thought I should, from my body measurements, I have cut according to the amount of ease I wanted using the finished garment measurement. The size I thought I needed would have ended up with a massive amount of ease! I have been spending tea breaks and such watching the online classes, and have bought a couple of things that I think may be useful. The first was a Rolson Magnifying head torch thingy from Amazon. Janet uses a professional standard tool called an Optivisor, but this was a fraction of the cost and included a torch on the visor. I have used mine today to unpick some tiny stitches on a linen garment for a client – I think I am converted. This has already proved its worth. The other thing I bought was a pack of FRIXION erasable pens. Janet uses these frequently to fine line mark points on the garment. They can be erased with a hot iron, but obviously I will need to test them on my fabric before I go wild. You may remember I recently bought a pair of Gingher shears which I have been very happy with. 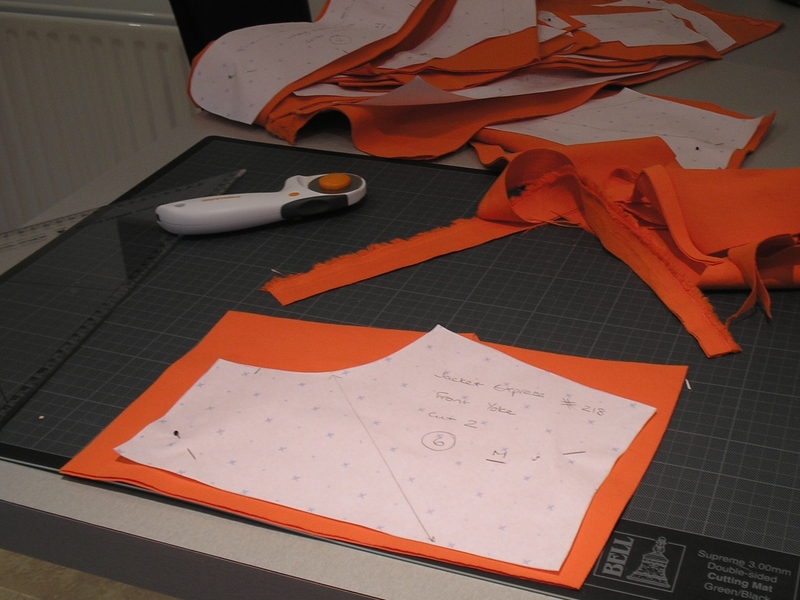 I was intending to use these to cut out the jacket – but Janet uses a roller cutter with mat. I have used mine just for cutting strips for bias binding and such but never thought they would be very good for an entire garment. Well, some things you just have to try. WOW! I was amazed at how quickly I got used to the pressure needed to cut both layers of cotton twill, and how to work my way around curves. I can’t say I am never going to use shears again but I am seriously impressed with how easy this job was. Like many dressmakers of many years experience (NO, not OLD dressmakers!) my wrist and hand does ache after cutting out and this really did seem to help. Cutting out with the roller thingy! That head torch sounds like a really good idea. And magnifier don’t forget! I suspect that this will be the money I consider best spent in a very long time. I’m pretty sure my kids would die if they came in the house with their friends and I had a head torch on my head… Just for that reason alone I may need to get one!! I am eager to hear what your thoughts are with the class. This is one that I am interested in taking however, have not done so. We (in the states) have similar complaints about the postal service, but there are some really good people who are employed there although the few bad seeds ruin it for all. Yea, rotaries are the awesomeness. If you find a fool proof way of sharpening them please do a post on it. 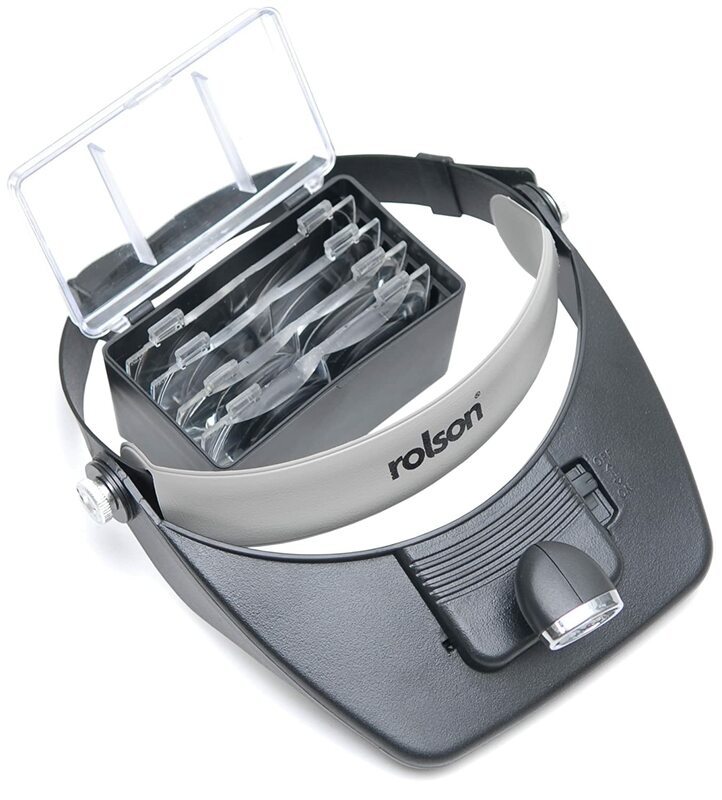 The circular plastic thingy that someone featured on their blog recently is a massive dose of ‘fail’ +( I’ve seen something elecronic (in a US ad online) that uses something like a knife blade sharpener but with turning action.. Perhaps you could ask your craftsy teacher if it comes up? I’ve tried using multiple folded layers of al-foil (slicing through them multiple times seems to work) but it doesn’t last long..